ESET NOD32 Antivirus is an award-winning antivirus with fast and powerful detection. Its new Anti-Phishing module identifies and protects you from fake websites trying to acquire your personal information. ESET Smart Security is an all-in-one Internet Security solution with new Anti-theft feature that locates your missing laptop and gives you tools to help recover it. Adds a layer of protection to your Mac® so you can enjoy safer technology with fast and powerful detection of Mac- and Windows®- based threats. Enjoy the full power of your Mac with protection that leaves more power for programs you use daily to work, play and browse the Internet without slowdowns. Award-winning ThreatSense technology uses multiple layers of threat detection to deliver the most effective protection possible against new attacks. Want even more control over your phone and an extra level of protection to give you peace of mind? Stay connected without worry safeguarded by a raft of premium features. Enjoy surfing on the go and downloading apps while safeguarded by proven antivirus. Yes, your Mac is a safe platform with a strong security record, but Mac viruses and other cyber attacks still pose an ongoing threat. 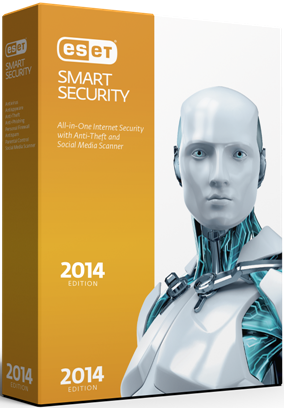 ESET Cyber Security protects you from these threats so you can explore the web with confidence. 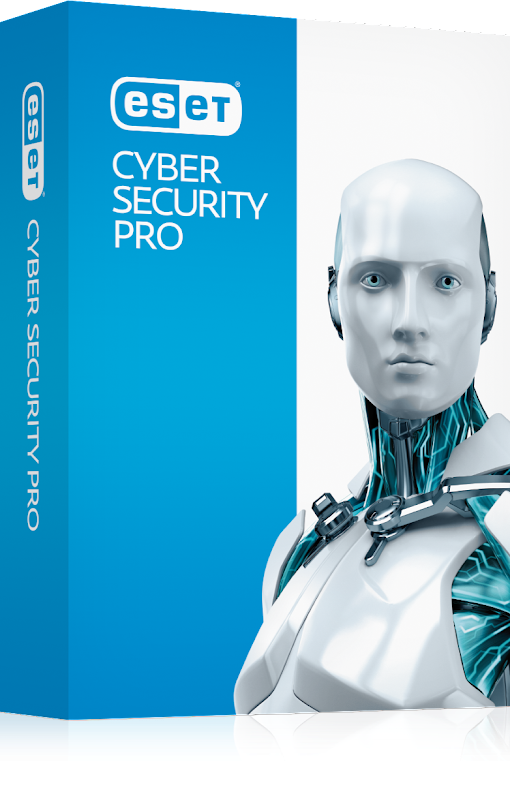 ESET is a pioneer in the Antivirus industry for over 25 years and has a long track record of high performance.Our unified scanning core supports a breadth of operating systems and platforms with products that have earned an array of awards and accolades. 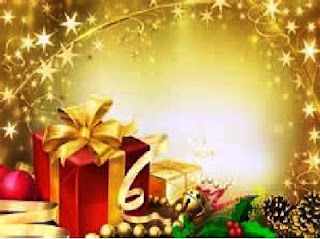 A special greeting at Christmas time to express to you our sincere appreciation for your confidence and loyalty. We are deeply thankful and extend to you our best wishes for a happy and healthy holiday season. 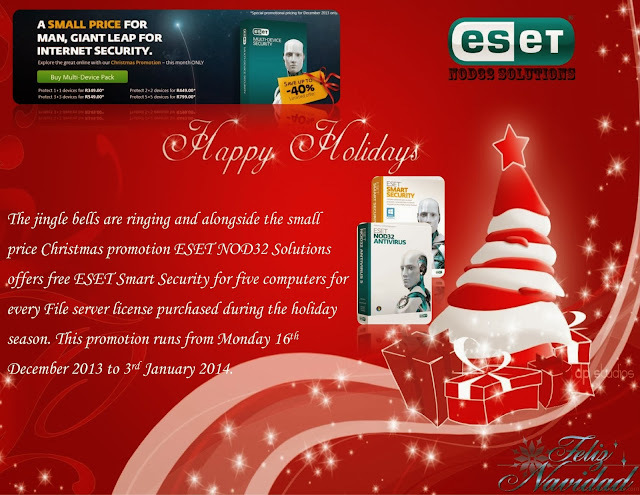 Feliz Navidad from the ESET NOD32 Solutions fraternity. Wishing you a Merry Christmas and a happy new year!! With the International Monetary Fund (IMF) stating in a report in October this year that output in sub-Saharan Africa is expected to “expand by 6% in 2014″, academics and technology specialists have agreed that the projected growth will also fuel demand for skills. The ICT skills shortage experienced internationally, including South Africa, has also increasingly been experienced by countries in Africa. According to Professor Andre Calitz of the Department of Computing Sciences at The Nelson Mandela Metropolitan University (NMMU), the ICT skills shortage estimates presently are between 20 000 and 70 000 in S.A. and over a million in the USA and Europe. ITNewsAfrica has solicited the opinions of several operators, of varying levels, within the domestic ICT space to narrow down a list of the most sought-after tech skills and the relevant areas of discipline they are applied within business. 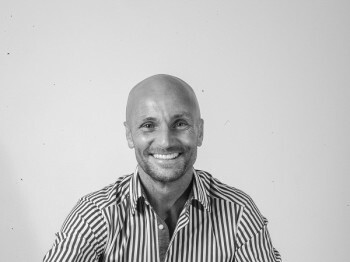 Simon Campbell-Young, CEO of Phoenix Distribution says the use of business software, in any sector, has become an integral part of an organisation’s ability to perform tasks with a greater degree of efficiency, accuracy and ease. In fact, the most successful companies in every industry build their business processes around the functionality found in today’s software programs based on best-practice methodologies, industry standards and regulatory compliance he says. Demand for software developers will be driven by development for mobile and the surge in popularity of app, particularly as areas like mobile money expand. According to The Mobility 2014 research study, conducted by World Wide Worx with the backing of First National Bank, a tipping point in mobile apps use was reached in 2013, with more than half of urban cellphone users – 51% – now using these tools. The rural market, too is growing fast, with its 27% usage level surpassing the overall market of 18 months before. With the anticipated growth of ecommerce, especially in markets like Nigeria (consumers are expected to spend approximately $920 million in online purchases in 2014), competition to stand out on the Web will be fierce. As such the demand for those skilled in search engine optimisation will escalate as decision makers look to invest in what will likely be an immediate asset in businesses. Best practices and leveraging off tools to bolster online presence will differentiate in the market. Those individuals who are responsible for testing systems, solutions or applications and are integral to the software development process. They are there to ensure that all processes and procedures agreed upon are adhered to – and that standards are maintained. With the expected emphasis on software development and how this can differentiate business, QA testers will be in demand. The adoption and application of cloud computing remains a topic of discussion in the ICT industry. Analysts suggest that the demand, globally, for this skill sets has grown substantially to the point where demand has moved past supply – making cloud computing one of the more lucrative technology skills to possess in 2014. According to research study, Cloud in Africa: Reality Check 2013, released by World Wide Worx and Cisco, In 2013, 50% of South African medium and large businesses are using Cloud services; while a slightly lower proportion – 48% – are using the Cloud in Kenya. Nigeria lags behind, with only 36% of businesses currently using the Cloud. A significant 44% of Nigerian businesses say they will embrace the Cloud in the coming year, bringing the total in that country to 80% by the end of 2014. This compares to 24% of organisations in Kenya and only 16% in South Africa saying they will be taking up Cloud. With the dominant position that software is expected to take in helping to shape communications infrastructures in business, it is little surprise that software engineers – those who are primarily tasked with the design, writing and testing of computer programs – will stand out in markets hungry for the very best technical skills. Analytics and the ability to use data strategically, particularly in terms of predictive analytics for business, will influence business in 2014. The use of systems and tools to delve into data and add measurable value to operations will dominate commerce in the foreseeable future. This is the frontline of business intelligence and the transformation of raw data into practical useful information. As far as ICT service, solution development, integration and application is concerned, 2014 is anticipated to be the year for customer-centric strategies. To this end, the help desk or centre of information for customers about products/ services will emerge as a key area of growth and activity. Although the help desk and call centre environment is always recruiting, the need for skilled practitioners is expected to escalate in 2014. From entry level right through to more advanced skills, qualifications such as routing and switching, as well as network security, administration and professional are all expected to be in demand next year. Networks will remain the lifeblood of organisations and experts in this space confirm that there will be a demand for a range of skills. Mobility is a reality for enterprise – whether decision makers like it or not. Given the advent of mobile devices in the workplace, the increase in usage by employees and significance of BYOD, industry analysts have pointed to the relevance of Mobile Device Management (MDM) strategy and application. According to a report by Juniper Research, by the year 2018 there is expected to be more than 1 billion employee-owned mobile devices in the enterprise. Technology executives have referred to an IDC statistic which claims that by the year 2020, third platform technologies (mobile, cloud, social and big data) will make up 80% of all IT spending compared with 20% in 2011. Having skilled personnel on board to apply strategy and skill to optimise the trend will be hugely beneficial to companies. With the increasing relevance of BYOD, mobility and apps driving data management and strategy, the issue of access to information and security remains a key consideration for businesses. Skilled employees who can effectively manage the security strategies of businesses and guide decision makers in terms of compliance with legislation, safety and integrity of data will be sought after. Leading academics have emphasised the country’s risk profile when it comes to cyber fraud, citing a severe lack of skills to counter this problem. The Communications Commission of Kenya (CCK) has announced this week that it will initiate an audit of the quality of non-voice services to consumers. The regulator has confirmed that it is scouting for consultants to assist with a comprehensive Quality of Service (QoS) measurement to scrutinise the quality of text, data and social media services. Local media reports suggest the Regulator has undertaken the exercise in recognition of the general move by consumers towards non-voice services. The idea is to evaluate performance and user experience. Statistics reported in the media state that for the year ending June 2013, the use of texts increased by 208% to 13 billion messages, whilst internet subscriptions grew to 12,9 million. The consultant who is chosen to form part of the initiative will be expected to come up with a framework and methodology to be applied to QoS measurements. This will also cover inspection of communications licensees and ICT installations. Recent research conducted by IDG Connect suggests that there is a definite move towards big data projects in Kenya and Nigeria. According to this research, 64% of respondents are at planning, pilot scheme or live stage of Projects. It is indicative of the increasing level of interest in big data, big data analytics and the relevance of the cloud to enhance operations and accelerate growth in the enterprise. For many years, businesses have been making decisions based mainly on transactional data (who bought what). Beyond that critical data, however, is a potential treasure trove of non-traditional, less structured data: blogs, social media, email, sensors and photographs that can be mined for useful information. Big Data gives a business the ability to spot market trends, capitalise on business prospects and to target products better than ever before. The affordability of both storage and computing power has made it feasible to collect this data – which would have been discarded only a few years ago. Many companies, as a result, are looking to include non-traditional yet potentially very valuable data with their traditional enterprise data in their business intelligence planning. To generate cost-effective results from Big Data, enterprises need to look beyond on-premises IT to cloud computing. Practicality and cost are two key drivers behind cloud adoption in Africa. The cloud is perfectly suited to Big Data with massive storage, elastic expandability and pay-as-you-go billing. Instead of maintaining costly infrastructure, cloud computing allows the user to pay just for what is used when it is required. Industry analysts have referred to predictions by Gartner and reaffirmed the belief that the adoption of public cloud services will continue to escalate amid continued efforts by organisations to drive down IT spending. 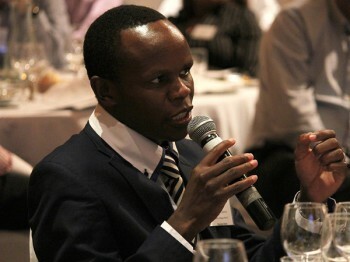 Africa’s technology news leader IT News Africa, in partnership with sponsor and global enterprise software company, Software AG, extends an invitation to the Africa’s ICT sector to attend its forthcoming Innovation Dinner in Kenya, themed Big Data, Cloud and Accelerating Growth in the Enterprise. The event is scheduled for 10 December 2013 at the Sarova Panafric Hotel, Nairobi, Kenya. The big data cloud Innovation Dinner will feature several engaging discussions and presentations that will address relevant topics, including how to make the most of big data and Cloud Computing to handle the rapid rate of delivery of extreme volumes of data. The sessions will also tackle the question of how all this data can be analysed and used for the benefit of business. José Henriques VP Data & Online services, Airtel. The Innovation Dinner has an established following within the continent’s rapidly developing ICT sector (click here to view photos from past dinners). Previous sponsors of IT News Africa’s Innovation Dinner series include HP, Ericsson, Huawei, IBM, BlackBerry, Dell, SAS, Nedbank Capital, MTN, SAP and Adobe amongst others. “Our nation has lost its greatest son. Our people have lost a father,” said South Africa’s President Jacob Zuma late on Thursday night. The President made the tearful announcement that former President Nelson Mandela has passed away at his house in Houghton on 5 December. The news announcement, which was broadcast on all of South Africa’s SABC channels, evoked a huge response on social networks, with people from all walks of life sharing memories, sending condolences to the family, and relaying tales of their experiences with him. “What made Nelson Mandela great was precisely what made him human. We saw in him what we seek in ourselves,” Zuma continued. Users took to Twitter as soon as the news broke, and while Mandela has been gravely ill over the last couple of months, it still came as a shock to many. Virgin boss Richard Branson sent a tweet regarding the news, writing “Thanks for your inspiration, friendship & the joy you brought into our lives #RIPNelsonMandela”. The company has set up a page at http://www.virgin.com/richard-branson/on-nelson-mandela to honour Mandela. “Today we lost not only a great man; we also lost one of the world’s greatest leaders. Everyone will have been impacted by Nelson Mandela in their own way – these are my personal reflections on the time I was fortunate enough to spend with him,” reads the opening statement. Radio show host Gareth Cliff broke the news to his followers, before rushing off to the 5Fm studios for live coverage. “Former President Mandela is dead. Love and condolences to our great nation, and his family. Nkosi sikelele’ iAfrika”. MTN Nigeria tweeted “We lost a great leader. RIP Madiba”. 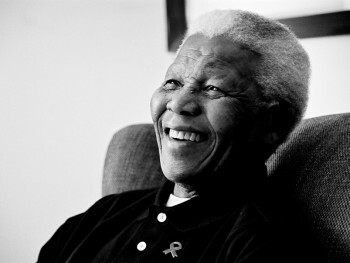 “Without ‪#‎Mandela this beautiful being wouldn’t have been able to live in this country. RIP Tata. Thank you,” wrote technology journalist Pippa Tshabalala, posting it together with a picture of her son. Twitter’s social video sharing site Vine posted a short video to honour his live. “A tribute to Nelson Mandela https://vine.co/v/hxTVulzmY2t by @nowthisnews #RIPNelsonMandela,” they posted. 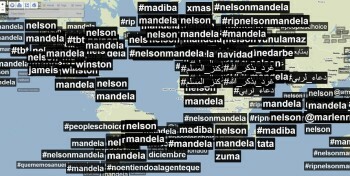 Mere hours after the news broke, #Mandela, #RiPMandela and #Mandela was trending on Twitter throughout the entire world, as confirmed by social media tracker company Trendsmap. “RIP Nelson Mandela, whose courage and character inspired South Africa and the world. My recent remarks on his legacy” – US Senator John McCain. “Honestly, just imagine how different the world would’ve been without Nelson Mandela. He’s changed our lives so much” – US singer Beyonce. 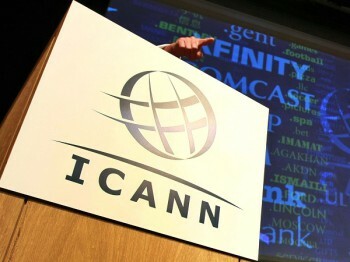 Internet Corporation for Assigned Names and Numbers (ICANN) plans to launch some 1900 new Generic Top Level Domains (gTLD’s). This new system will allow for the registration of generic words, geographic names and brand names as top level names, for example .lawyer, .africa, .zulu, .google and .clothing, and ICANN has established a so-called ‘Trademark Clearinghouse’, which came into effect on 26 March 2013. “If you register with the Trademark Clearinghouse (TMCH) you will be entitled to register your trade mark as a domain name during the so-called ‘Sunrise Period’ for each new gTLD as and when it comes into effect. This will give you a preferential registration right, in that you will be able to register your trade mark as a domain name before the general public are able put in their applications,” the company said in a statement. In line with MTN South Africa, ESET NOD32 Solutions would like to urge shoppers to be alert amid the prevalence of crime during the festive season. “We would like to remind customers to be vigilant about safety and to guard against theft and fraud, not only during the holiday season, but always,” says Lily Zondo, General Manager Risk Management at MTN SA. Vigilant shoppers can avoid fraudulent upgrades, SIM swops, holiday hoaxes, SMS scams and identity theft. When customers suspect irregular activity on their phones or online accounts, alert ESET customer Operations straight away and remember to never divulge your personal documents or details such bank accounts and ID numbers to anyone. We urge all travelling customers to make sure their data roaming is switched off before they leave. With all this in mind, we urge customers to be aware of their surroundings at all times and to be cautious while shopping and travelling during this holiday period. Newspaper headlines that the international space station might have been compromised by a computer virus might be sensational and grab much attention, but seem far removed from everyday organsations and businesses most of us work for and with. But the reality is that while this sort of high profile attack grabs media headlines, the majority of businesses around the world also face cyberattack and their networks will be compromised – either by professional cybercrime gangs or in this case the actions of a well meaning insider. While every year organisations around the world spend millions of dollars on internet security designed to stop cybercriminals getting into their networks. And while that is undoubtedly a major threat, research from technology analyst firm Forrester, suggests actually one of the biggest threats is from company insiders who were the top source of breaches in the last 12 months, with 36 percent of breaches stemming from inadvertent misuse of data by employees. Of course this should not be a surprise to anyone – after all insiders have the most unfettered access to critical systems and data so it stands to reason they would be a top route for attacks and data disclosure problems. But this research illustrates the need for enterprises to monitor their systems and data for suspicious changes and activities, regardless of the source. Merely watching network traffic into and out of the network is not sufficient. It seems people cannot stop themselves clicking on links they receive in emails without even the most cursory check on whether it is a valid link or not. It is an easy step often overlooked that you hover your mouse over the link and see what web address it is trying to send you to. A customer of ours who manages security for one of the biggest banks in the world openly suggests the issue of members of staff clicking on links in emails as one of the biggest issues his team faces. Clickers just can’t help themselves clicking it seems just to see what happens … even when they know they shouldn’t! Cyber criminals are very clever and so they often go to great lengths to disguise their malicious intent by replacing a single letter in a valid web address to trap the unwary, after all looking quickly, it is difficult to spot when what should say: www.thisisvalid.com is changed to www.thisisvalids.com or something similar. Also people are largely trusting in nature. If you get an email from a friend, family member or work colleague with a link, we tend to think it is genuine and trust the content. Yet again we know that cybercriminals can easily mock up an email reportedly from an acquaintance to fool us into believing it to be genuine. New research commissioned by Sourcefire has revealed that 90% of UK workers surveyed have clicked on a web link embedded in an email with two-thirds (66%) admitting they very rarely first check to ensure the link is genuine. Social media, and other publicly available data enables those same criminals to build up a profile of what interests us and so when they target us, they do so with something convincing which we will be more likely to believe. This is why visibility across the whole corporate network is critical to managing security. It is not enough to just defend the threat coming into and out of the network; you have to be able to manage the threat across the whole continuum, before, during and after the attack. By having detailed visibility into malicious activities, it enables businesses to detect, remediate and control malware outbreaks. Network File Trajectory and Device Trajectory allows security teams to quickly determine the scope of an outbreak and track malware or suspicious files across the network and at the system level. That way it is possible to spot how the attack got into the network; where it went from entry and what activities were carried out. This allows speedy resolution and remediation to limit the impact. This week, Smile Communications Tanzania (Smile) launches its Fourth Generation Long Term Evolution (4G LTE) services in Arusha, bringing the high speed internet revolution to businesses, organizations and residents in and around Arusha city. LTE (Long Term Evolution) also known as 4G LTE enables ultra-high-speed internet access because it is the cutting-edge fourth-generation (4G) mobile technology standard and represents a step change in evolution from existing wireless technologies such as GSM-2G/GPRS/EDGE and UMTS-3G/3.75G. 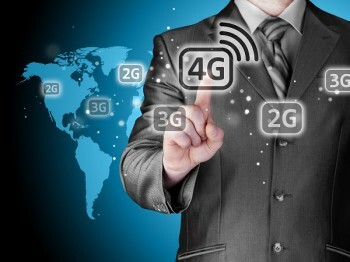 4G LTE is the future platform of all online as well as voice and data communication, and its inherently flexible and constantly evolving nature guarantees that it will remain the superior standard in mobile data and voice services for years to come. “Smile launched in Dar es Salaam on May 16 2013, making Tanzania the first country in Africa to access this revolutionary technology. We are very excited about bringing this technology to Arusha. As a notable international hub that has vast, thriving and dynamic service and tourism sectors and a range of learning institutions, Arusha has so many businesses, organisations and people that will benefit from high speed internet,” said Fiona McGloin, Smile Country Manager for Tanzania and Uganda. “We at Smile are confident that providing reliable, high speed internet will significantly contribute to the success of Arusha based businesses and also give the people in Arusha a faster, more reliable and cost effective service,” McGloin said. In Tanzania’s vibrant communications sector, 4G LTE internet now leads the race being six-times faster than 3G and four-times faster than 3.75G. Smile provides an average speed of 6Mbps download and 3Mbps upload. With this technology users are guaranteed faster downloading and importantly, faster uploading speeds for files, emails, data, music, movies and games; for accessing internet based applications; and for on-line streaming of videos/TV without buffering. “We pride ourselves in bringing high speed internet to Arusha that is comparable to the speed and quality enjoyed in Europe. Smile won’t just provide ‘an’ internet service, we will provide the fastest, most reliable internet service at a transparent competitive price and we also commit to delivering high-level customer satisfaction and service,” added McGloin. Windows XP remains the world’s second most popular operating system, even though Microsoft plans to officially retire it on April 8, 2014, and only a few companies have actually made the move to newer software. A research conducted by VMware in October reveals that no less than 94 percent of the organizations on Windows XP are still running the aging platform, with only 34 percent of them actually planning to migrate. At the same time, 36 percent of the IT managers admit that the transition to a newer operating system is not even close to being completed. Out of these, 79 percent are saying they are moving to Windows 7, while 35 percent have picked Windows 8. The study, which was conducted by Vanson Bourne, but sponsored by VMware and Dell, also revealed that businesses have an average of 24 applications that are only compatible with Windows XP, which obviously makes the move to a newer platform a bit more difficult. 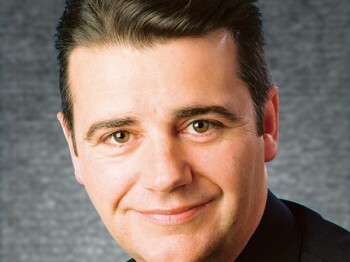 “The most notable thing about this research isn’t just how few companies have fully migrated from Windows XP to date, but how many business-critical applications there are still in operation that will only run on XP,” commented David Parry-Jones, regional director, UK and Ireland at VMware. At this point, Windows XP is running on more than 30 percent of desktop computers worldwide, which makes the aging platform the second most popular OS in the world. Microsoft continues its plans to move users from XP to a newer platform, reminding that no security patches and updates will be released as of April 8, 2014. At the same time, Microsoft might also stop delivering updates for Security Essentials on Windows XP. Some of the revelations of the past year raised questions about the way we use the Internet nowadays and the type of risks we face. In 2013 advanced threat actors have continued large-scale operations, and cyber-mercenaries, specialist APT groups “for hire” which focus on hit-and-run operations emerged. Hacktivists were constantly in the news, together with the term “leak”, which is sure to put fear into the heart of any serious sys-admin out there. In the meantime, cybercriminals were busy devising new methods to steal money or Bitcoins. No ITSec overview of 2013 would be complete without mentioning Edward Snowden and the wider privacy implications of his revelations. One of the first visible effects was the shutdown of encrypted e-mail services such as Lavabit and Silent Circle. The reason was their inability to provide such services under pressure from law enforcement and other governmental agencies. Another story which has implications over privacy is the NSA sabotage of the elliptic curve cryptographic algorithms released through NIST. The majority of the cyber-espionage campaigns that analysts have seen were designed to steal data from governmental agencies and research institutions – Red October, NetTraveler, Icefog and MiniDuke all behave this way. The most widespread campaign of the year was NetTraveler espionage which affected victims from 40 countries all over the world. For the first time ever cybercriminals harvested information from mobile devices connected to the victims’ networks – clear recognition of importance of mobile to hackers. “We predicted 2012 to be revealing and 2013 to be eye – opening. That forecast proved correct – 2013 showed that everybody is in the same boat. In truth, any organisation or person can become a victim. Not all attacks involve high profile targets, or those involved in ‘critical infrastructure’ projects. Those who hold data could be of value to cybercriminals, or they can be used as a ‘stepping-stones’ to reach other targets. This point was amply illustrated by Icefog attacks this year. They were part of an emerging trend that appeared in 2013 – attacks by small groups of cyber-mercenaries who conduct small hit-and-run attacks. Going forward, we predict that more of these groups will appear as an underground black market for ‘APT’ services begins to emerge. Stealing money – either by directly accessing bank accounts or by stealing confidential data – is not the only motive behind security breaches. They can also be launched to undermine the reputation of the company being targeted, or as a form of political or social protest. Ongoing hacktivist activities have continued this year as well. ‘Anonymous’ group has claimed responsibility for attacks on the US Department of Justice, Massachusetts Institute of Technology and the web sites of various governments. Those claiming to be part of the ‘Syrian Electronic Army’ claimed responsibility for hacking the Twitter account of Associated Press and sending a false tweet reporting explosions at the White House – which wiped $136 billion off the DOW. For those with the relevant skills, it became easier to launch an attack on a web site than it is to co-ordinate the real-world protests. The Bitcoin system was implemented back in 2009. In the beginning, this crypto currency was used by hobbyists and mathematicians. Soon, they were joined by others – mostly ordinary people, but also cybercriminals and terrorists. They provide an almost anonymous and secure means of paying for goods. In the wake of the surveillance stories of 2013, there is perhaps little surprise that people are looking for alternative forms of payment. And it is gaining popularity – in November 2013, the mark surpassed the 400$ for one Bitcoin. The methods used by cybercriminals to make money from their victims are not always subtle. Apart from Bitcoins, which could potentially be stolen, ‘ransomware’ programmes became a popular means of making easy money – cybercriminals block access to a computer’s file system, or encrypt data files stored on the computer. Then they warn you that you must pay in order to recover your data. This was the case with the Cryptolocker Trojan. The cybercriminals give their victims only three days to pay up, accepting different forms of payment, including Bitcoin. The increasing availability of affordable customer premise equipment (CPE) and smartphones in East Africa is driving the broadband services market in the region. Greater demand for access to social media platforms, especially on mobile devices, sustains broadband penetration. The laying of undersea cables, too, has helped enhance the reliability of networks, aiding market development. New analysis from Frost & Sullivan, East African Broadband Market, finds that the market earned revenues of $109.5 million in 2012 and expects this to reach $159.2 million in 2017. The low broadband network coverage in Ethiopia, Sudan and Rwanda – covering an average of just 20 percent of the geographic area – is indicative of a large under-serviced market and the high growth potential it offers. Despite infrastructure expansion, insufficient broadband capacity continues to pose a major challenge for the development of the broadband market. 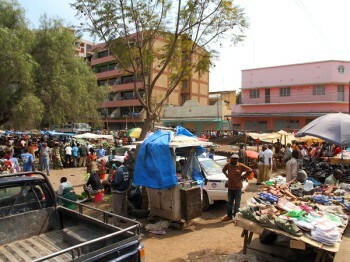 The low disposable incomes of customers and a lack of local content, such as eLearning and eCommerce, also affect market income. Service providers need to develop relevant local content to gain traction in this market. Moreover, providing more affordable handsets can help boost the adoption of broadband services and enhance customer loyalty. New market participants should also target areas without broadband services by ensuring affordable tariffs for both consumers and businesses. Technology firm, ESET NOD32 Solutions, has joined in the fight against cybercrime in the country. The action comes in the wake of the problem reaching unprecedented levels and stakeholders in the information and communications technology sector calling upon the government to institute legislative measures to curb the menace. The Managing Director for ESET NOD32 Solutions, Geoffrey Ombachi, said that the company had been disseminating information about the looming problem through its blog (www.esetkenya.blogspot.com). He said this was part of efforts to make the public aware of the crime. “We are at the forefront in the fight campaign for proper cyber-security policies that will see cyber-crime perpetrators being tried and sentenced in a court of law. "We have strategies of joining hands with internet security corporate in a bid to scrap off pirated software from the market,” said Ombachi in an exclusive interview. Ombachi further stated that the company was going to join in the fight against pirated software that had been pointed out as a major contributor to surging cases of cyber crime. “Pirated software has contributed to a lot of security breaches in the country. "Microsoft Corporation started that fight in 2011, Adobe got into the fight in 2012, we would like to take the fight to the next level by April 2014,” added Ombachi. Ombachi added that the company educates Kenyans on the significance of running an authentic antivirus programme as well as upholding safety practices when browsing the internet. Cyber crime is gaining prominence in the country with reports indicating that more than 1 000 Kenyans fall victims to the crime on daily basis. It is feared that this number is set to double up by next year if urgent measures are not taken to address the issue. - CAJ News. Kenya has scooped the World’s Leading Safari Destination Award at the 20th World Travel Awards (WTA) grand finale in Doha, Qatar.The Kenya Tourism Board(KTB) disclosed on Monday that the country received the most votes from travel agents worldwide at the auspicious ceremony held on 30th November 2013 to beat other competing destinations. The award comes barely a month after the country’s tourism marketing agency Kenya Tourism Board (KTB) was voted Africa’s leading Tourism Board in Africa by WTA during the Africa chapter held in Nairobi in October. KTB Managing Director Muriithi Ndegwa termed the award an endorsement of Kenya as a home to authentic safari. Unique attractions such as the annual wildebeest migration are one of the most memorable Kenya safari experiences that have continued to put the East African nation on the map. Is your company’s software legit? The use of business software, in any sector, has become an integral part of an organisation’s ability to perform tasks with a greater degree of efficiency, accuracy and ease. In fact, the most successful companies in every industry build their business processes around the functionality found in today’s software programs based on best-practice methodologies, industry standards and regulatory compliance. However, many companies in South Africa still use illegal copies of software, be it at user or network administration level, not realising the full implications of copyright infringements when financially benefiting from pirated software. Software piracy can generally be described as the unauthorised duplication, distribution and use of copyrighted software programs either for personal or commercial use, and let’s face it, today it’s as easy as “copy and paste”. The most common form of software piracy in organisations is referred to as “softlifting”, when a business purchases a copy of a software program with a single user licence, which is then loaded onto multiple computers by employees with or without consent. Some companies justify their use of pirated software by saying that the cost of the software is simply too high for its intended use, or that once the company has grown it will be more open to the idea of registering legal copies of the software. Others feel that their companies are simply not big enough to face viable prosecution and with the lack of enforcement of copyright infringement laws they are unlikely to get caught. But while copying software seems harmless it is essentially theft of intellectual property and employers are liable for the actions of their employees. It is in fact a serious crime and could spell dire financial and reputational risks to organisations if they are exposed by disgruntled employees or are audited and do not comply with copyright laws. On the flip side of the coin, software piracy is destroying the very industry it is benefiting from. In fact, it is the worst problem facing software development today. An entire ecosystem of software development organisations relies on the legitimate sale of software products. Using pirated software not only dilutes the industry, but reduces job opportunities for developers, the future longevity of these products and the cost to consumers who obtain the software legally. According to the 2013 Global Information Technology Report recently conducted by the World Economic Forum (WEF), South Africa ranks 20th (35%) out of 144 countries for lowest software piracy rate. Based on findings by BSA / The Software Alliance conducted in late 2012, the WEF states that a 10% decrease of software piracy in South Africa over four years would create 1 650 high-tech jobs, R9 091 million in new economic activity, and R967 million in new taxes by 2013. Importantly, 68 percent of those benefits were expected to be confined to the South African economy. So how can organisations protect themselves from unknowingly benefiting from pirated software and contribute to the sustainability of the commercial software development industry? · Assess your software supply chain. Organisations should align themselves with reputable dealers, be it via physical retail stores or from a website, that only sell legitimate software and are painfully aware of the risks of selling or distributing software that contravenes the end-user licence agreements (EULAs). · Do your homework. An EULA stipulates the terms and conditions regarding the use of the software, and if it can be legally copied onto other computers or not. IT departments should be made aware if there is more than one copy of software installed in the organisation and check if it complies with copyright laws as stipulated by the content owner. · Register your software. Almost all software installations today require organisations to register and activate the software via an Internet connection or by phone, which allows them to use and have timeous access to updates, security patches and technical support. It also prevents individuals from installing the software onto other computers. · Educate employees on the implications of software piracy. Software piracy equates to stealing and is an unethical business practice that can result in civil and criminal penalties. · Enforce network policies. Organisations should have network policies in place which restrict access to peer-to-peer file sharing networks that allow anyone to download pirated copies of software, music or movies. This also reduces the risks of falling prey to embedded identify theft tools and computer viruses that accompany some pirated software. Liquid Telecom South Africa today announced that it has provided broadband to forty schools on behalf of the Foundation for Internet Development working for the Department of Education and the Coza Cares Foundation which enables sustainable ICT environments in under-resourced South African schools through collaboration and partnerships. The schools are all located in rural parts of the North West Province. Liquid Telecom South Africa has allocated a dedicated channel on its satellite service for the schools. This provides unlimited capacity as well as Deep Packet Inspection of traffic. The content, destination and origin of data can now be monitored 24x7x365 with automatic blocking of inappropriate material. Part of the installation was completed by the first participants in Liquid Telecom’s Entrepreneurship Development Programme which has been specifically designed to drive both education and entrepreneurship in South Africa. The programme provides practical work and business experience for recent graduates which will enable them to work within the telecoms industry in the future as both employee and employer. Octavia Kumalo, Managing Director of the Foundation for Internet Development, says “We are pleased that we were able to partner and assist Liquid Telecom in the realisation of its Entrepreneurship Development Programme. Through more partnerships of this nature, we will be able to ensure that one of the country’s most pressing priorities – small business development aimed at the youth – is addressed”. Craig Young, Head of South African Broadband Services at Liquid Telecom, says “The broadband service we provide is second to none in South Africa and provides our customers with access to the entire Liquid Telecom network in Africa. Education is vital to the economic future of our country and this project has enabled our trainees to gain valuable experience whilst bringing the next generation of South Africans online”. Philemon Kotsokoan, IT Director for the Education Department of the North West Province of South Africa, said “Getting fast reliable broadband into schools and enabling students to access information and resources from across the North West is a core objective for us. 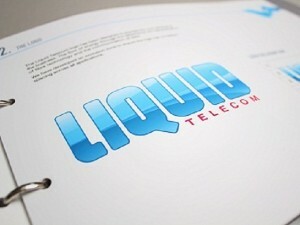 We are extremely happy with the service Liquid Telecom has provided”. 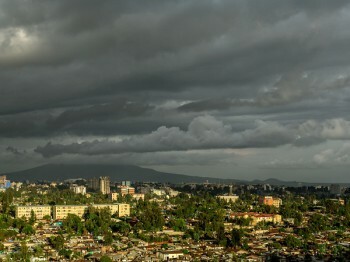 Following a $1.6 billion deal between Huawei Technologies, Ethiopia’s state-run Ethio Telecom and ZTE, an eight month project to bolster local connectivity services throughout Ethiopia will be spearheaded by the rollout of 4G connectivity services in the country’s capital. A high speed 4G network, scheduled to be implemented by Huawei, forms a crucial part of the joint venture to expand mobile phone infrastructure nationally. Among the expected outcomes of the project are that some 400,000 subscribers stand to benefit, that the country will increase the total number of subscribers and there will be an enhancement of existing 3G services. In August the acting CEO of Ethio Telecom, Andualem Admassie, was quoted by Ethiopian Radio and Television Agency as saying the Project is important in contributing to efforts to increase telecommunications service access and coverage nationally. Kenyan mobile service provider Safaricom has acquired mobile operator Essar’s 10% stake in the undersea fibre optic The East Africa Marine system (TEAMs). 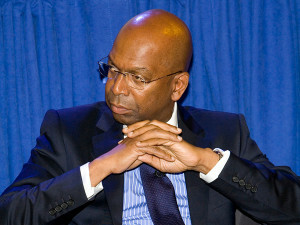 The value of the deal has not yet been made known, but Safaricom now owns 32.5% of the cable. “The stake was sold to Safaricom in September at undisclosed figure, and the finances from this sale went towards yuMobile’s operations. It was an investment made by Essar, which was not being used for operations. This bandwidth had always been idle since we acquired it five years ago,” said Madhur Taneja, Essar Kenya CEO. Safaricom added that the extra 10% it purchased from Yu Mobile will enable them to offer faster and more efficient Internet data services, which will also contribute to Safaricom’s upgrading schedule of their 4G network. “The additional shareholding in TEAMs entitles Safaricom to have increased capacity on the 1.28 TB/s international cable. It is an integral part of our data strategy to have sufficient international capacity to feed the demands of our growing customer base and to support our terrestrial fibre strategy and LTE (4G network) plans. While Safaricom now holds the majority share in the cable, other shareholders include the Kenya government (20 per cent), Telkom Kenya (20 per cent), Kenya Data Networks (10 per cent) and Jamii Telecom (6.25 per cent). From Nairobi, local media have reported on targets that the country’s communications regulator, the CCK, has set – including the objective to increase the current rate of mobile money service use from 58.9% to 70% in the next five years. In a strategic plan for the period 2013 – 2018, the CCK has mentioned its intention to up levels of TV broadcast coverage from what it is today, at 55%, to at least 80%. 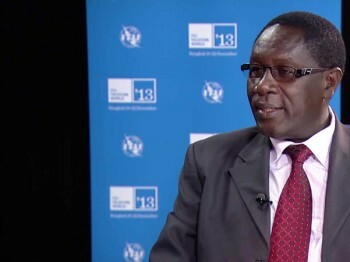 Director General of the regulatory body, Francis Wangusi, has confirmed the organisation’s desire to “accelerate uptake of ICT services by 2018”. The new regulatory plan reportedly takes into account the growing popularity of mobile money and ecommerce, along with internet penetration and efforts to curb cyber crime. The CCK has outlined its plan to facilitate internet penetration for 70% of the population, up from its present level of 41.6%, as well as to drive up the mobile telephony penetration rate to 90% compared to the current rate of 75.8%. Media reports say the ICT contribution to the GDP stands at 2.2%. The CCK is said to want to increase this to 5% over the next five years. 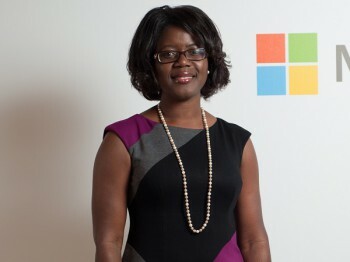 Microsoft has announced the appointment of Otema Yirenkyi as the company’s first country manager for Ghana. As the company shifts its global focus to a devices and services offering, Ghana remains one of Microsoft’s critical investment markets in Africa. Otema, a native Ghanaian with over 14 years of ICT experience, will take the helm of its increasing investment in the country. Otema is Microsoft’s first female country manager on the African continent and holds a BSc degree in Industrial and Labour Relations, as well as an MA in Development Studies. “We have seen tremendous growth in broadband availability and internet penetration in Ghana, as well as the introduction of newer devices such as tablets and smartphones, which have fundamentally changed how consumers experience and use technology,” says Otema. Ghana’s current mobile penetration rate is at an estimated 112%, after the country hit the 100% mark at the end of 2012. These numbers are the highest in Africa, placing Ghana 49th in the world, according to the International Telecommunications Union (ITU). Microsoft has been operating in Ghana through its partner ecosystem for 10 years and continues to recognise the country’s long-term growth opportunities. Otema’s appointment is an investment in Ghana’s future growth and Microsoft’s vision to establish a robust presence in the country. Over the years and through a number of programmes, Microsoft has trained 15, 000 teachers, impacted over one million students, created over 1, 800 jobs, and supported 35 successful startups in Ghana. The company’s flagship African investment and growth initiative, Microsoft 4Afrika, was launched in February this year to actively engage in Africa’s economic development, and has further entrenched the company’s commitment to Ghana and its people, ensuring that technology plays a key role in the developing economy. “We are delighted to have Otema on board in this critically important role,” says Hennie Loubser, General Manager of West, East, Central Africa and Indian Ocean Islands. “She has the track record and credentials to help grow this dynamic market, and she is deeply committed to Africa’s economic development. Otema’s focus in Ghana is on continuing to improve access to technology, skills development opportunities and resources. “I think once African entrepreneurs have increased access, affordable technologies and the ability to monetise innovative ideas, they will create solutions that solve many of the economic and social challenges confronting Africa,” she says. One of Microsoft’s core projects in the country is its partnership with the Ghanaian Ministry of Education and the British Council, to set up ICT hubs in local schools and communities to accelerate digital literacy across the country. Falling under a regional project called Badiliko, 17 digital hubs have been created in Ghana and Microsoft has trained 26 local Master Trainers who are serving as Digital Ambassadors and School Leader Facilitators in the hubs, helping over 1,700 people in Ghana become trained to date. Building on the success of its programmes and initiatives in Africa, Microsoft continues its commitment to a strong, successful history on the continent and strategic economic hubs like Ghana will become more integral partners to its African business strategy. 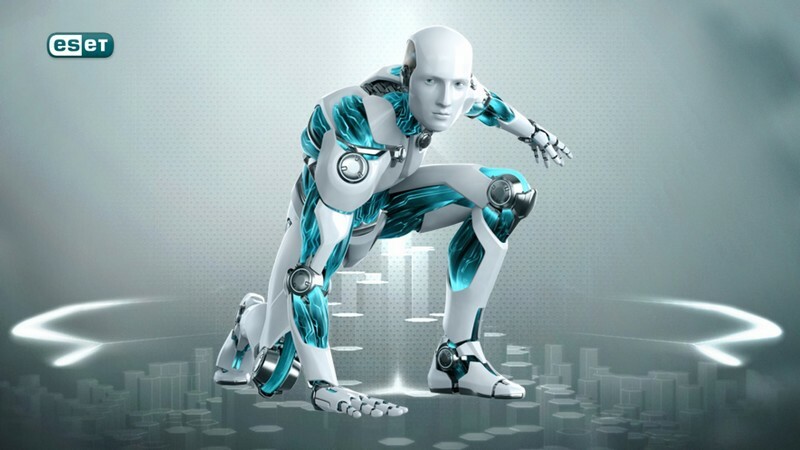 ESET NOD32 Solutions was incorporated in the Kenyan Republic in 2009. It is an authorized ESET partner and exclusive distributor of its products in Kenya, owned and operated by Pamrose technologies under license from ESET, spol. s.r.o. info@antiviruskenya.co.ke | sales@antiviruskenya.co.ke . Powered by Blogger. 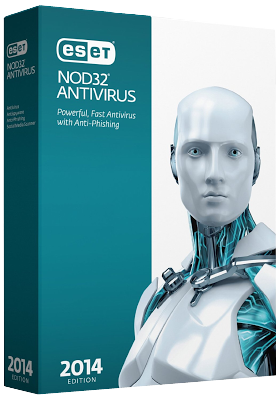 ESET Nod-32 antivirus is simple, well designed and easy to use, and can be recommended for large or small networks.At ESET, security of our customers and safe internet browsing always come first and we are glad this is proven by this test. ESET Mobile Security excels with 99.7% detection rate. It offers a slick security suite for Android smart-phones, which impressed us with its intuitive interface. ESET is the first and only company in the world with ICSA certification for Mac OS X. ESET Cyber Security features the same engine as ESET NOD32® Antivirus Business Edition for Mac OS X, which earned the certification.